The American Dream is still alive and well, in big cities and small towns all across the nation. At its heart, you'll find the spirit of hard-working men and women. Men and women who share a dream, who understand what it means to try harder and give more--working together to keep the promise of America alive. These are your friends and neighbors, your family--the people who stick with you through thick and thin. 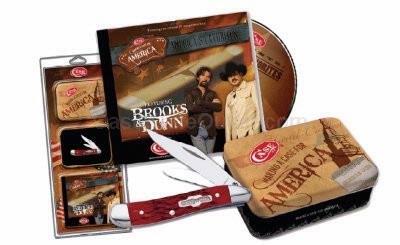 That's why W.R. Case & Sons Cutlery Company has launched the Making a Case for America campaign to champion the cause of the American worker and American-made products. And that's why Country Music superstars Brooks & Dunn are joining in the effort- fighting for American jobs, for hometown values, and the people they sing about. By buying American, and buying local, you are supporting your friends and neighbors- you are "Making a Case for America." CD includes America's Favorite Songs: Boot Scootin' Boogie, Only In America, Born And Raised in Black And White, Rock My World (Little Country Girl), Hard Working' Man. Good Day To Be Me, That's What She Gets For Loving Me, We'll Burn That Bridge, Your Gonna Miss Me When I'm Gone, She Was Born To Run, and Bonus Track: Making A Case For America. As with all natural material color and texture may vary. Made in the USA.